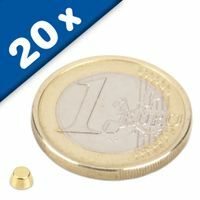 The Neodymium Cone Magnet is the optimal pin wall magnet. 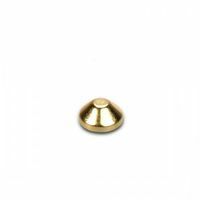 The conical design helps to easily remove the magnet from any pin wall, because the magnetic force is enormous. 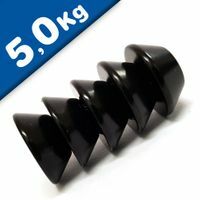 Cone-shaped magnets have one large face often described as the base, and one small face often described as the tip, and are generally magnetised with their north and south poles on these faces. The tapered, conical shape produces a concentrated and more intense magnetic field on the tip compared to the base. 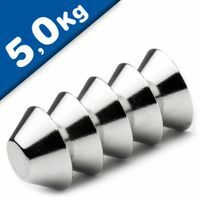 The Neodymium magnet cone is the optimal pin wall magnet. 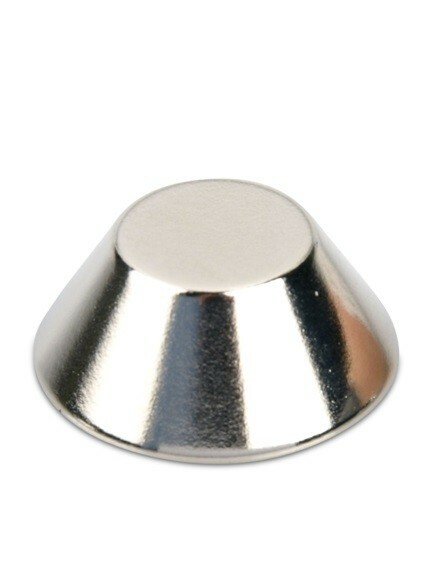 The conical design helps to easily remove the magnet from any pin wall, because the magnetic force is enormous. 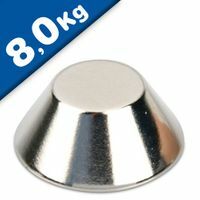 Cone-shaped magnets have one large face often described as the base, and one small face often described as the tip, and are generally magnetised with their north and south poles on these faces. The tapered, conical shape produces a concentrated and more intense magnetic field on the tip compared to the base. This makes them particularly sought after for medical and research applications but also other applications where the maximum magnetic performance is required from a small pole face. An everyday use for cone magnets is on glass wipe boards as the concentrated magnetic field produced at the tip easily penetrates the thickness of glass to the steel backing board and the cone-shape makes them easy to handle and reposition. They are perfectly suitable for whiteboards, magnetic boards, etc. The stump holds notes securely and it can be easily removed by pulling it off to the side. If the base is attached to a metal surface, however, it is hard to remove. 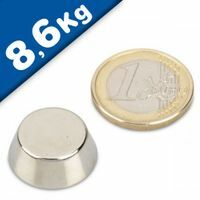 Please note that all neodymium rare earth magnets are fragile and require extreme caution when handling due to their brittle nature and to avoid injury due to pinching.